On February 21, I stepped out into the clean streets of Vienna on a cold morning, and got only slightly lost before being welcomed into Andreas Fogarasi’s studio. Bright, light, and airy with the high ceilings and windows of a previous era, the first thing my eyes were drawn to was the floor-to-ceiling bookshelves full of beautiful publications. Fogarasi said it was more an architect’s office than the typical artist’s studio, and indeed his background training is in architecture. It remains an ongoing concern in his artistic practice, which explores the mediation and representation of society through its architecture and the branding of cultural identities, often through the medium of sculpture and film in an open-ended, referential way. I had approached the artist about discussing two particular projects that investigated cultural phenomena of Hungary: Kultur und Freizeit and Vasarely Go Home. 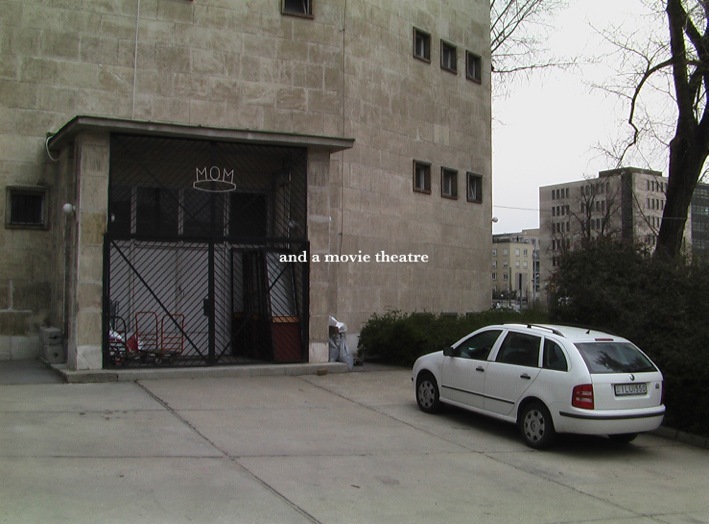 Kultur und Freizeit, a project begun during a residency in Budapest in which he wanted to investigate its cultural centers, eventually became a series of six films. Cultural centers, built in different periods of the last century as working class community centers of sorts, are featured with the camera lingering over their different architectural styles and, almost as an extension or addendum, alluding to their different socio-cultural fates. 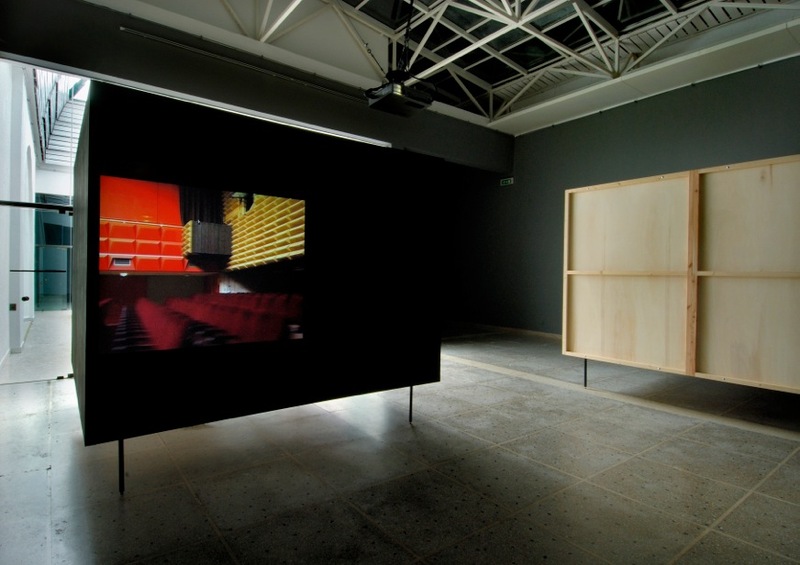 The final group of films was presented at Hungary’s pavilion at the 2007 Venice Biennial. The short films, ranging from 4 to 8 minutes, were presented in minimalist black cubes that situated the viewer in enclosed environments at eye level with the film. Unfinished plywood backs reflected an awareness of the boxes as architectural/sculptural object, just as the films reflect a meta-awareness of their presentation as film. The accompanying publication, on display in an adjoining room of the pavilion, included the Hungarian pavilion as a cultural center/structure, extending this meta-awareness yet again. Questions raised by the work include ideas about the production and ownership of culture: how this has changed historically, what constitutes culture, how it is disseminated and/or controlled, and with what attitudes we approach it. 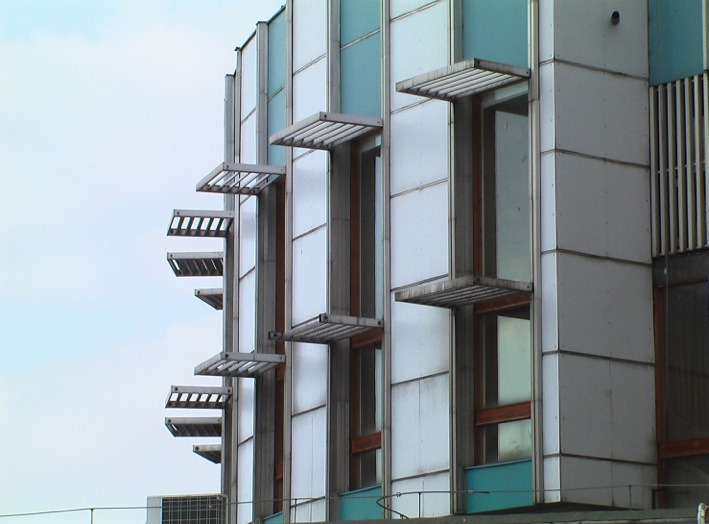 Take for example, the Hungarian architecture of the ’60s, generally reviled or dismissed as being Communist, and the cultural centers that one interviewee refers to as “brainwashing machines.” Fogarasi allows for an appreciation of these “well-made” buildings and a tacit acknowledgment that Modernism does not in itself express political ideology. Or, as he put it, “What is a Communist building?” Similarly, because they were decentralized, these cultural centers, in addition to functioning as brainwashing machines, were in some sense autonomous and at times were able to be used for distinctly non-official activities. The approach of the films tends toward the exploratory rather than the didactic as the buildings are presented without specific context or linear structure. 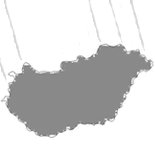 At times fragmented text suffices as narrative. No end point or editorializing perspective is introduced, yet overall the suggestion is of an interest in the possibilities of space rather than a treatment of these buildings as fully realized historical facts. The second project we spoke about is Vasarely Go Home, a more documentary approach to a historical incident, which Fogarasi realized at the invitation of the Reina Sofia museum in 2011. His entry point into the subject of the film was a fascination with artist Victor Vasarely, a Hungarian exile who settled in Paris and became noted for the popularization of Op Art, a dynamic fashion as well as artistic trend in the 1960s. As a renowned international artist from Hungary, Vasarely was invited to do a show at Budapest’s Kunsthalle in 1969 despite Op Art not being a style supported by the Socialist government. 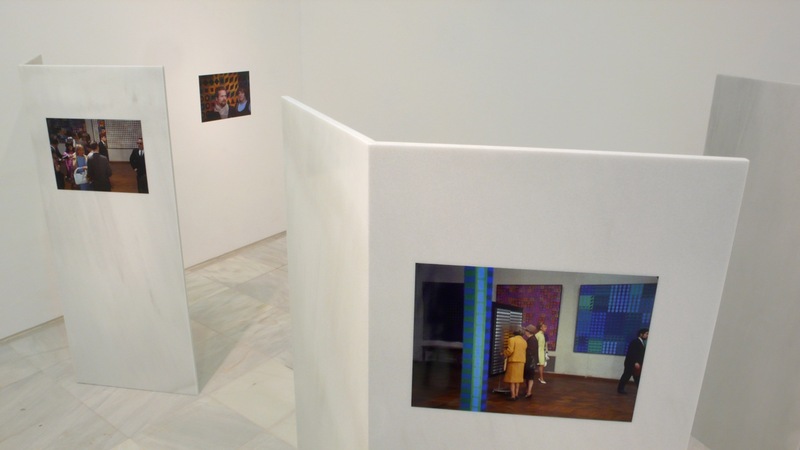 At the opening, a local artist named Janos Major staged a discreet one-person protest with a small sign in his pocket reading “Vasarely Go Home,” an action that became the stuff of legends in the unofficial avant-garde Budapest art circle of the time. The response to this double event testifies to inclusion and exclusion, West and East, politics and culture, and the making of art history in the region, showing as it does the intersection of two radically different artistic forces—something which Major acknowledged in his action. Fogarasi presented this event through interviews with Hungarians who were involved in the cultural scene of the time on large back-to-back screens with English subtitles on one side and Spanish on the other. 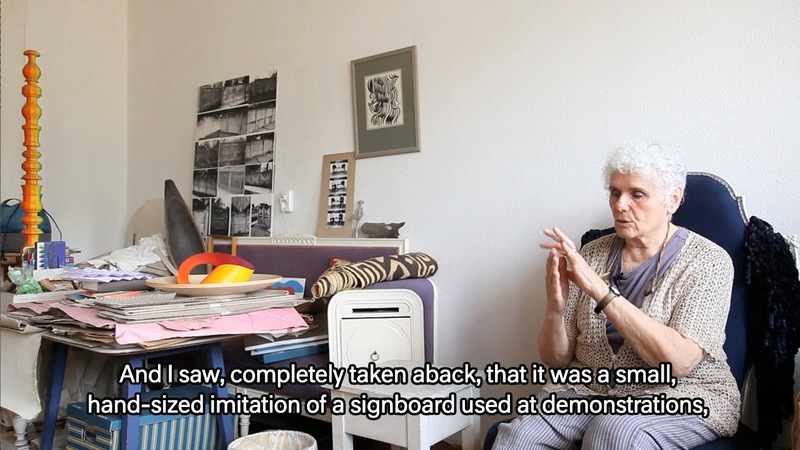 Now the film can be viewed online at http://vasarelygohome.museoreinasofia.es. 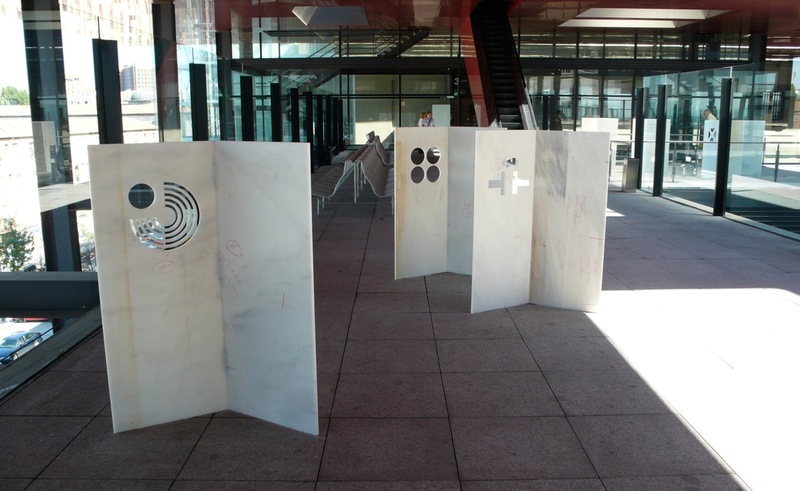 Fogarasi was also able to find and display archival images of the 1969 exhibition opening, which he displayed on a crowd of marble stands at eye-level. Calling attention to the display of the photographs, and thus the exhibition as mediation of information, the thin pieces of marble were left unfinished and marked on the back. Additionally on the terrace on top of the museum were a series of sculptures related to Fogarasi’s interest in cultural branding. Logos of institutes that represent national culture abroad (such as the Goethe Institute) were cut out of the same, industrially produced 1-inch-thick marble slabs, which again showed a reflexive self-awareness through the marked backs. While both projects explore Hungary’s specific cultural heritage, Fogarasi’s interests lie in the representations of cultures and architectural space in a more universal way. The Austrian artist explored his connection to Hungary in an early piece—a simple sheet of paper—on which was typed in alpha order the surname at which he had received mail. Fogarasi is a Hungarian name, but the mail he received mangled this unfamiliar name with many misspellings; Austrians, for example, often replaced the F with a V. Simple misspellings align to form an exploration of identity. Although his parents are from Hungary, Fogarasi is not a Hungarian citizen. This creates a not unprecendented, but interesting dynamic in terms of his representation at the national pavilion of Hungary in Venice. This familial connection to Hungary exposes Fogarasi to a local knowledge and culture, but yet he is removed from it. His interest is in these subjects is not solely in a particular sense but also as representative of larger cultural trends that relate to the general concerns of his work. The way both projects operate internationally—a Golden Lion for Kultur und Freizeit (subsequently shown internationally in almost 20 shows), the Reina Sofia’s support for a ‘local Hungarian’ topic—suggest that he is able to translate a specific local context into international terms successfully. This entry was posted on February 27, 2013 by linnea8 in Artist Meeting.